I was asked by my Lab Manager to investigate whether one of our CO2 incubators was working properly. Apparently there’s some doubt as to whether it was maintaining CO2 levels. CO2 is an easy gas to detect for the same reason that it causes global warming: it absorbs infrared radiation. 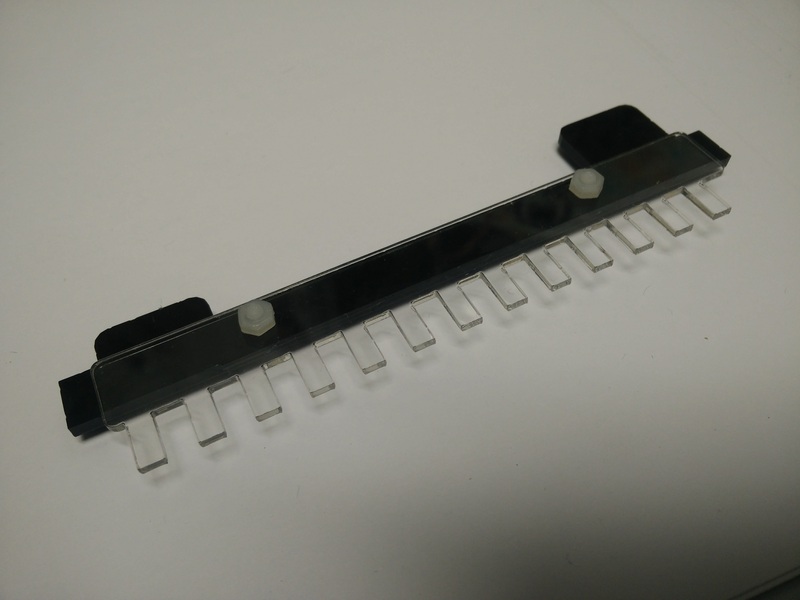 You can now buy cheap Non-Dispersive InfraRed CO2 detectors for about US$40 from websites such as AliExpress. However, CO2 incubators typically enrich CO2 to about 5% by volume while most of the cheap sensors only measure up to around 0.5%, or 5,000 parts per million [ppm]. I found a sensor from Sandbox Electronics that works up to 10% by volume, or 100,000ppm. Perfect for testing CO2 incubators. The MH-Z16 NDIR CO2 Sensor costs $67.95 and comes with a UART to I2C adapter. This makes powering it and communicating with it quite simple: just connect four wires to the development board of your choice! I used an Arduino Nano to read the values from the sensor and send them to the laptop over the USB connection that was also powering it. 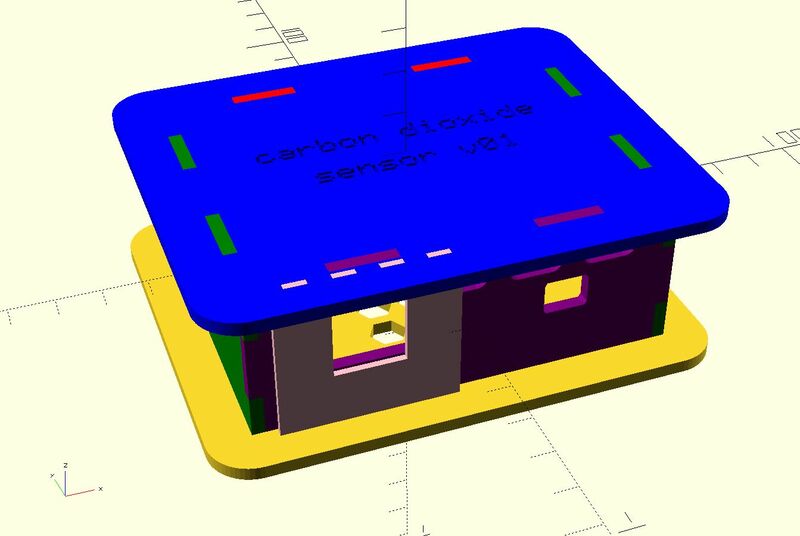 The sensor can be calibrated in atmospheric CO2 conditions at the push of a button. I have reservations about this one-point calibration but “you pays yer money…”, as my dad used to say. The Nano is sitting on a screw terminal shield with mount holes for easy connections ($4 well spent for making secure, non-permanent connections to the Arduino). On the laptop screen you can see data coming in from the example sketch I copied from the vendor’s website and using the Arduino library they provided. The sketch sends a reading every second. The serial output shows a starting CO2 reading of 458ppm which climbs slowly to >1000ppm when the photo was taken. This is because I was sitting in front of the sensor taking the photos and it’s registering a local CO2 increase as a result of my breath. If I huffed on it it climbed to >10,000ppm, or 1% by volume. The sensor is very slow to adjust to changes. I had to huff on it for a good couple of minutes until it got that high. Wikipedia tells me that exhaled breath is normally 4-5% CO2 so I guess if I’d kept at it for a while it would have got up there. I might have passed out before then though! 😆 When I moved it away from me it took several more minutes to come back down to ambient levels. Not ideal but fine for my application and budget! The three ions at the top are acetic adducts of the three common plant sterol glucosides, whereas the three at the bottom are chlorine adducts of the same molecules. You can see they coelute and their m/z delta is 24. This is just an image, I haven’t worked out how to post interactive Plotly figures yet. #along with this program. If not, see <http://www.gnu.org/licenses/&gt;. # now, let’s hack that data out! # plotly colourscales – take your pick! 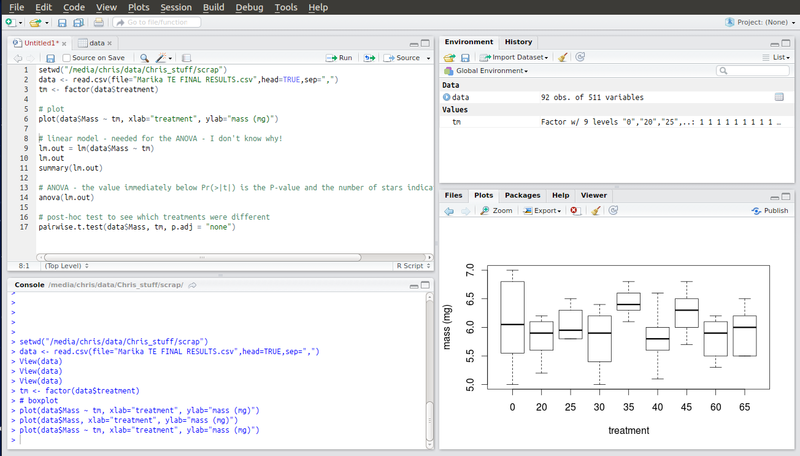 R is very powerful but awful to teach students to use. My students almost universally detest it because they have to learn to code. Unfortunately they haven’t much option but to use it to get stats done! (XLSTAT anyone?) So I wanted to throw out a quick post detailing how to carry out an ANOVA in R and interpret the output the easy way. Most importantly I don’t want to get into the mechanics of R or the theory of stats. I’m far from an expert in either but this is the simplest and most common test I need to get students to perform so hopefully this will save them and me a lot of headaches in future. First you need a data set saved in comma separated value format (.csv) with a header row containing the name of each variable. Open a spreadsheet and copy your data into this format with one row of variable names at the top of the sheet and numbers in the column below. You may only have one header row and you can’t use spaces in the names. If you must use multiple words for variable names separate them with underscores. In this example each row contains data for one sample. The first four columns characterise the experimental treatments the samples have been subjected too and the mass of sample analysed. You don’t need sample names or numbers, although it doesn’t matter if they are in there. They’re just not necessary for your stats. What the rest of the columns in this data set are doesn’t matter. As it happens they are peak areas from the GC-MS but they could be cell counts or enzyme activity or whatever you’re measuring. You should arrange your data like this in Excel and save the sheet as a .csv file in a convenient folder that you can label something like “stats” or “results”. # linear model – needed for the ANOVA – we don’t care why! Note that this isn’t as simple as copying and pasting a folder path in Windows! R requires that the forward slashes in the file path be escaped, or doubled up, so that it doesn’t mistake them as some sort of function. Google it if you want to know more. Next, you need to replace the name of my .csv file with yours. Make sure you don’t delete the speech marks. You now have two lines of code which will allow you to load your csv file into R. When you run these lines an entry will appear under Data in the Global Environment window. If you double click on it you will see a table of your data open in the Files window. In this data set the first column contains numbers that are not data but that are a code for the various treatments in this experiment. We don’t want R to treat these numbers as numbers, but as categories. Therefore the third line of code in the script tells R to create something called a factor to use as categories to interpret your data but not to use as numerical values. When you run this line you will see another entry in the Global Environment window confirming that R has created a new factor called “tm” with the numbers as names for each treatment category. 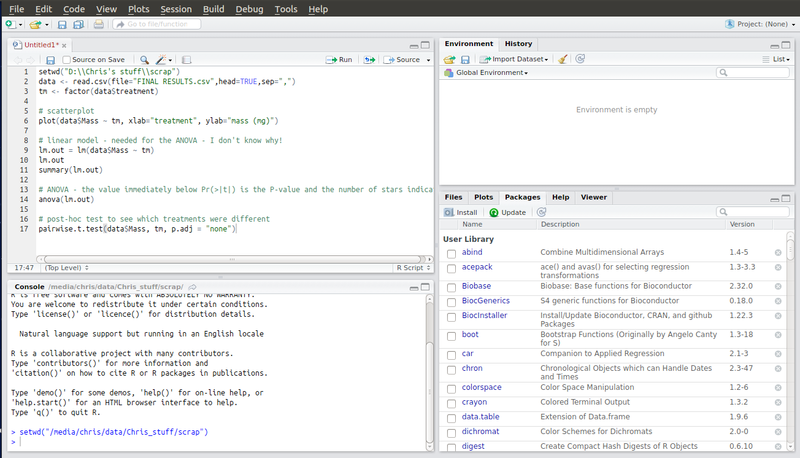 The next line of code allows you to plot your data by category. A useful way of viewing the distribution of your data before you start looking for statistical differences. 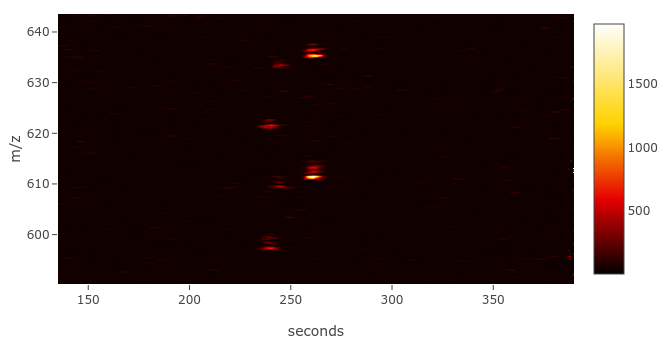 The two things to plot are specified as “data$Mass ~ tm“. 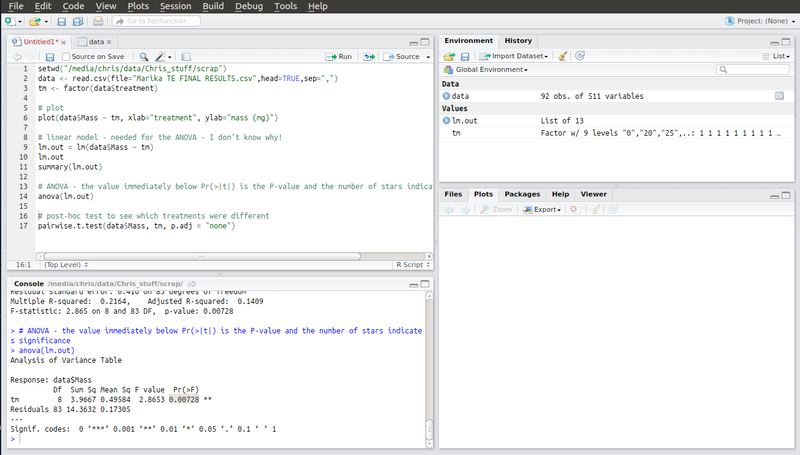 This tells R to take the continuous numerical data in the column titled Mass (N.B. 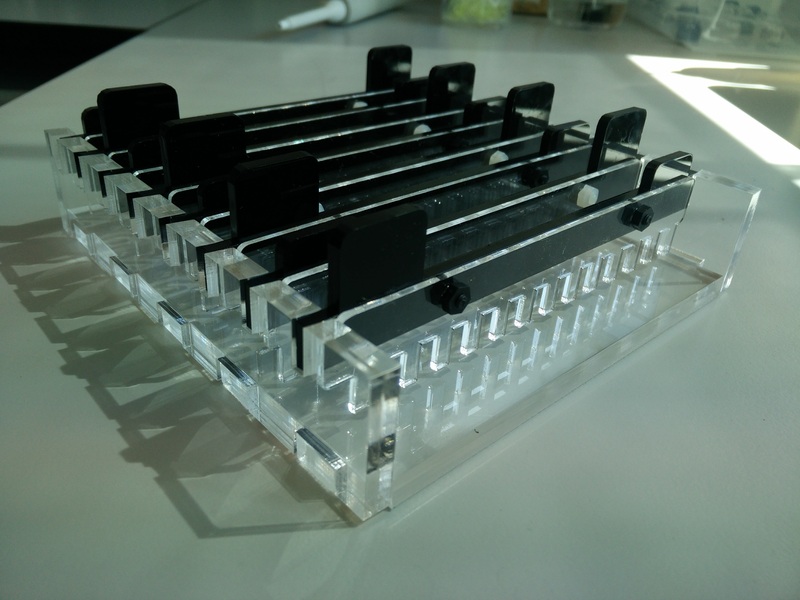 – case sensitive!) from the dataset called “data” and plot it against the factor called “tm“. 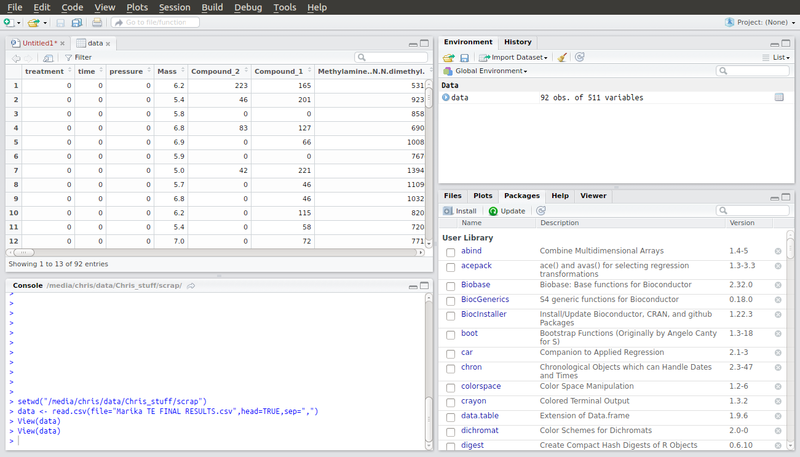 R will create a boxplot of the numerical data for data$Mass showing the distribution of the data. You should be able to guess, at this stage, whether you are going to get a significant result. I’m pretty sure that treatment 35 is going to be significantly different from treatment 40! The next few lines of code construct something called a linear model. I’m honestly not sure why R needs this to do the ANOVA. Like I said, I’m not an expert but it won’t work without them so you better go ahead and run them! The output is a table that you don’t need to interpret. Ignore it. The second to last line is the code to run the actual ANOVA. Running this produces an ANOVA table with the results of your analysis as a p-value under Pr(>F). If p < 0.05 one or more of your treatments is significantly different from the rest. I’ve highlighted my result here. R is kind enough to annotate your result with stars indicating just how significant it is. My p-value was less than 0.01 so it got two stars. Whoop! The final piece of code is something called a post-hoc test to determine which treatments are statistically different from each other. This is important as ANOVA doesn’t tell you this. It just tells you that something is different and not what. The pairwise t-test does tell you what and presents a t-statistic for each pair to let you know just how different. Interestingly the first column of results are the same as the output of the linear model. In the pairwise table they’re more easily interpreted and there’s results for all the other pairwise comparisons too, so much more informative. Importantly, if the ANOVA result is not significant you must accept the null hypothesis, even if the pairwise tests appear to show a statistically significant result. Its not an either/or scenario. ANOVA is more sensitive than t-test and is the determinative component. If the ANOVA is not significant the t-test results are meaningless, whatever their values! Edit 13-04-2017: The last thing to mention, which really should have been the first, is this: if your data does not comply with the assumptions of ANOVA you cannot use this test anyway. Data for ANOVA must be independent and exhibit homogeneity of variance (heteroscedacity). There is a common misconception that data for ANOVA must be normally distributed too. Tony Underwood has shown that ANOVA is relatively robust to non-normal data sets. 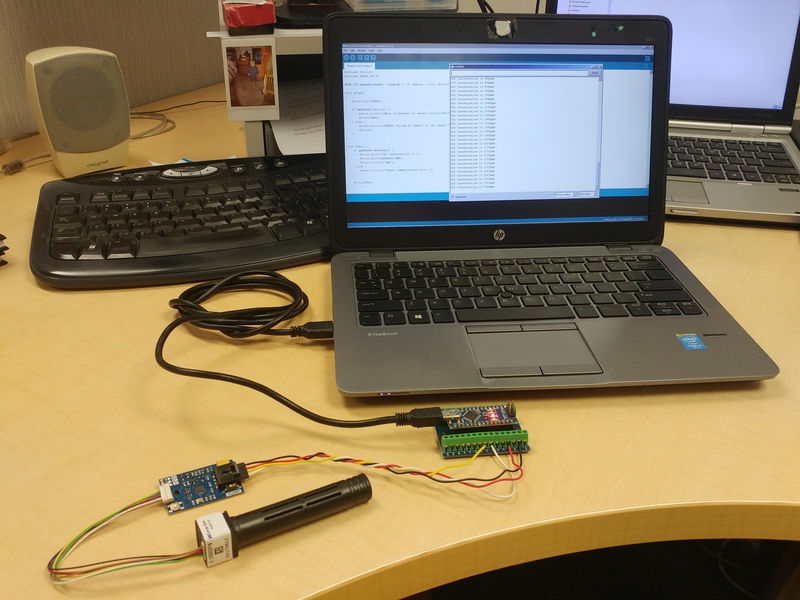 Collecting and logging sensor data automatically is one of the most useful “sciencey” things you can do with programmable microprocessors like Arduino and Raspberry Pi. One problem with this is what to do with the data you are collecting. You can store it locally to the device, for example Arduinos can log temperatures or movement signals from PIR sensors to SD cards. However, you have to turn the device off and remove the card, put it into a laptop and copy the data off it before you can access it. 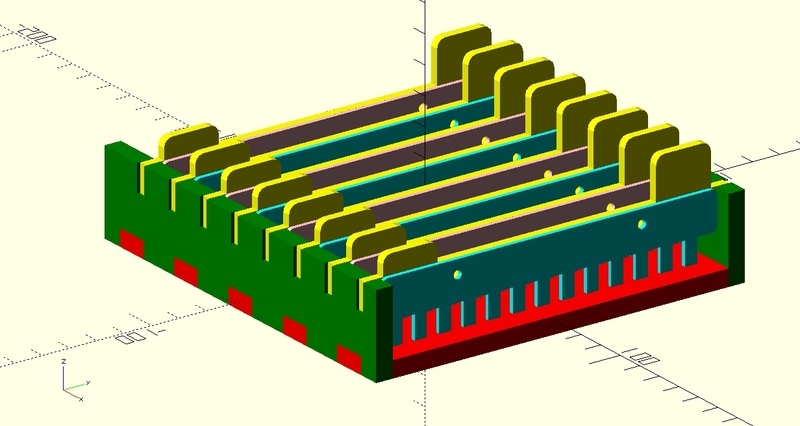 Alternatively you can send the data over a serial connection or wirelessly to another device which will store the data for you for easier retrieval or even real-time plotting. Recently small GSM/GPRS modules have become available which are essentially the guts of a mobile phone with no screen, battery or keyboard. These enable you to use mobile phone networks to send data to the internet using protocols such as GPRS and 3G. 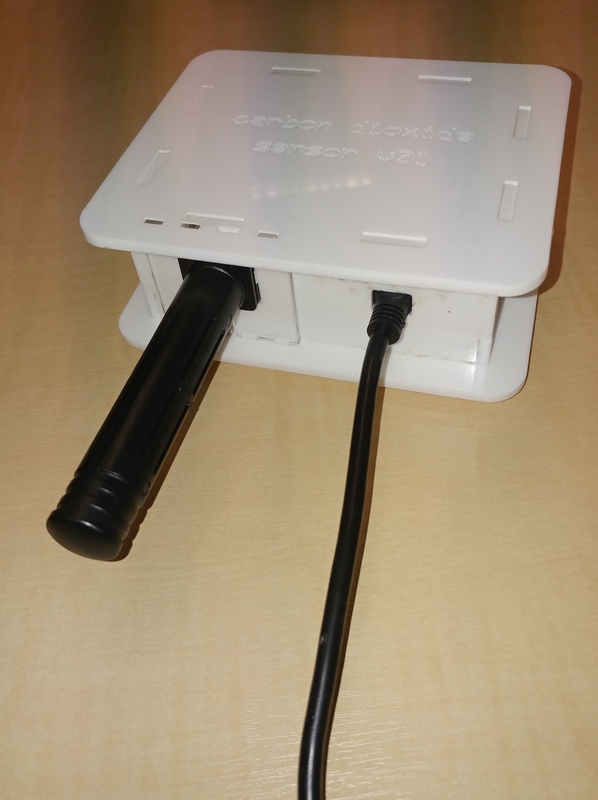 This is very useful for science as field experimental sites rarely sport ethernet ports or wireless routers through which to transmit data from long-term monitoring sites. To cut a long story short I managed to use a Python library to send updates from my laptop to Xively by HTTP PUT requests. Using more Python I then managed to log the text of those HTTP requests and use that as a template that I could deconstruct and send to the Fona from my Arduino, inserting real-time data from sensor reads. 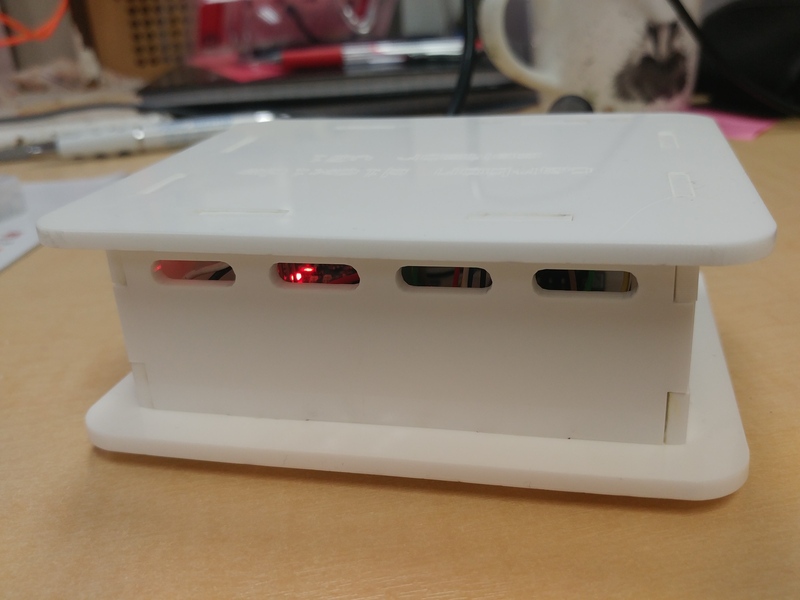 The result is the code linked at the bottom of this post, which logs temperature, pressure and humidity data from an Adafruit BME280 sensor as well as the battery voltage of the Li-Ion cell connected to the Arduino and Fona. Credit to Limor Fried/Ladyada and Chip McLelland, whose example sketches I adapted to create this. Here’s a quick pic of my setup. Its a Feather 32u4 LoRa, a uFL Fona and a BME280, all from Adafruit Industries. The Fona must have a lithium battery connected to it so I’ve added an 18650 Li-ion cell which is connected to both the Feather, which charges it, and the Fona. If the power does go out at work then the device will run for several hours on this battery, even without any low-power optimisation of the code. The enclosure is lasercut from 3mm acrylic. Its a beta version as I’ve yet to add mounts and an enclosure for the BME280. Ultimately I want this sketch to read three DS18B20 temperature sensors too, which will be in the freezers, but that’s a work in progress.